A glimpse of me: A BIG surprise! I know I've been gone for about a week I think but we've been SO busy and I've got a very good excuse: We bought a house!!! 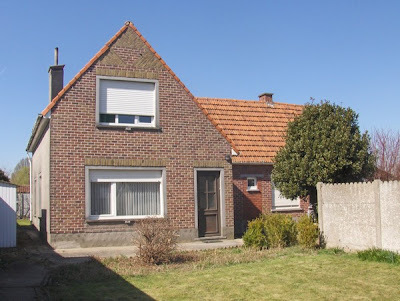 A house like this is fairly uncommon in Belgium. Most houses are terraced houses (I hope that is the right translation) with a small garden. I guess this was just a very big blessing! My dreams of being a SAHM in a nice house with a big garden where my kiddos can play all day. I'll make them all kinds of fun stuff (with ideas I steal from Natalie) and make my own bread, maybe even grow my own veggies. There's a place for chickens, bunnies and even for a pig!! Not too sure if we'll ever have a pig but I think some chickens would be fun (and we'll have or own free eggs!). And then a year later a baby?! Congratulations!!! The house is beautiful! The house is so pretty! Congrats to you guys!! Such a cute house! I'm so happy for your guys! Congrats girl! Congratulations!! I just adore it! It's so beautiful! Looks like a charming home and property! You sound just like me!!! With all of your plans . . . I would love to have a few chickens, having your own eggs is such a treat! But we cannot do that where we live now. We do, however, have two young dogs and two rabbits! That's fun!! :) Here's to your home and a happy future!